SwachhCoin is a unique blockchain-supported endeavor to manage household and industrial microfilms and efficiently convert them into useful products. These products, at the end of the process, will have a higher economic value. The team intends to investigate the current field of green energy, fertilizer and power generation. But given the rapid progress of fundamental research on efficient product conversion, the team hopes to adapt and work better with existing blockchain technologies. 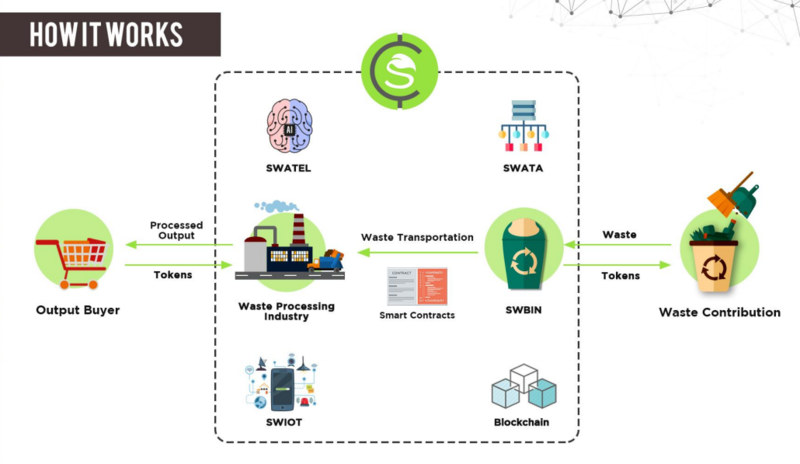 Not only this, by adapting Swachhcoin platform, the waste management companies will be able to dramatically increase their profits while increasing and easing their operational efficiency and capabilities. All this while creating a cleaner and greener environment. The above mentioned key features makes this platform better than any other available and years of research, correct partnerships and development gives us edge over any developing platform in this domain. The total number of Swachh tokens are 400,000,000 which is final (no new SCH token will ever be issued). The tokens are ERC20, the Ethereum token standard. Crowdsale: 69% tokens are allocated for Swachhcoin Token sale. Advisors and Partners: 7% of the tokens are for people willing to partner us and help us through our development. Swault (Swachhcoin Vault): 8% goes in the Swachhcoin Vault. 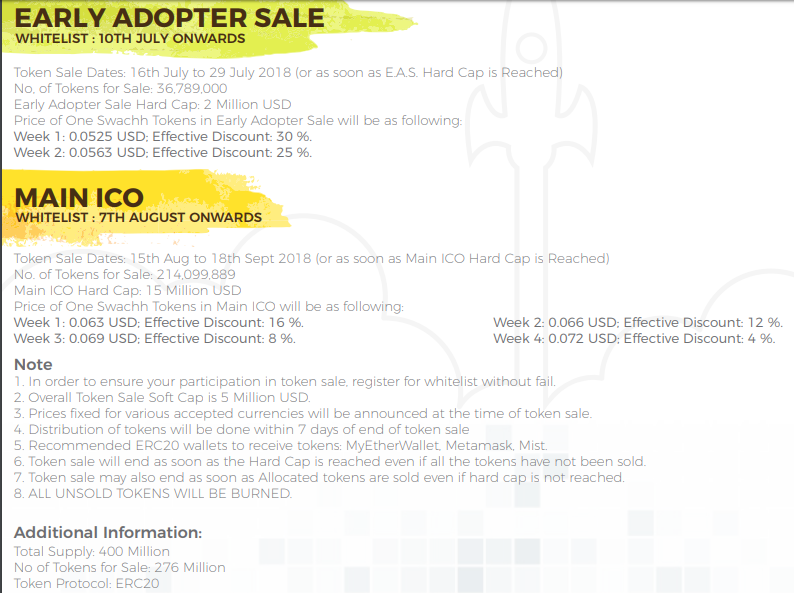 Bounty: 5% tokens are allocated to early adopters and marketing supports. Philanthropy: 3% are saved for our goodwill purposes. Team: 9% of the total tokens are allocated for the team members. The Crowdsale is subdivided into 2 rounds or events - Pre-Sale & ICO. The Pre-Sale and ICO are open to all. These together would account for 69% or 276,000,000 Swachh tokens. Out of which 9.1% or 25,111,111 Swachh tokens are allocated for Pre-Sale and the rest 90.9% or 250,888,889 Swachh tokens for the main ICO. This sets the hard cap to 18,000,000 USD and the soft cap to 5,000,000 USD.